Volstead has an interesting, and slightly eclectic, variety of craft beers (from near and afar) on offer, so it’s no wonder this place is a hit with Christchurch’s craft beer loving folk. If beer’s not your thing, there are delicious cocktails and a good selection of wine and spirits on offer too. 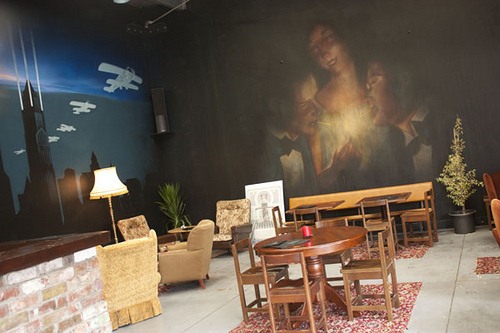 Volstead has quickly earned itself the reputation as being the coolest place to be seen on Riccarton Road. If you can brave the Riccarton Road traffic it’s well worth a visit to check out what is a perfect example of post-earthquake ingenuity – making something very cool out of not very much. Think an old converted garage, furniture that is reminiscent of stuff your Granny might have, a piano turned into a barbeque and a cute little caravan from which food offerings appear.